here is where I will share my tutorials that I create in psp and maybe a contest or two here and there. • All That Glitters scrapkit made by the very talented Laura (Cinnamon Scraps), it is available for purchase at Tantrum Scraps Store. She has extremely affordable kits there! However, you can find a FTU if you wish not to puchase the kit. • Tube I used was by Barbara Jensen and is available for purchase on her site, but any tube will do also. • Filters I used were Xero Porcelain, Mura Meister Copies, Super Blade Pro, and Eye Candy 4000 Gradient Glow. • Font used was Saginaw Bold. 1. Open up a blank canvas with a white background. I like to use a starting size of 700 x 700, but that is just a preference. We will be re-sizing later. 2. Open up the scrap bits you wish to use. I then re-size the DPI on them, as it's important that if you are using PTU tubes, you may not exceed 72 DPI. I tend to re-size each item before putting on my tag, so I don't need to worry about it later. If you do not know how to re-size the resolution, check on my tips and tricks board and you'll see an easy peasy way to do that. 3. Take frame 9 (black circular one with blue ribbon) if you are using the same tube I did. Re-size as needed to fit your canvas. Using your magic wand tool, click inside the frame (be sure to get all of the inner parts) and expand by about 5. 4. Add a blank layer beneath your frame and then paste paper 30 into the selection. I did that to get all the beauiful edging in there appropriately. Select none. 5. Select your background layer (the white one) and paste Paper 3 as a new layer. Then apply your WSL 2 mask and merge group. You may need to tinker with the sizing so that it's just barely peeking behind the frame, see my example above. 7. Now we want to add the tube to this beauty. Again grab your magic wand tool, and expand to 5 or so, invert your selection. Paste your tube benaeath the frame but above your paper back for the frame. You will want to re-size as appropriate, just make the tube fit in there all pretty. Once you have it positioned as you want, hit delete to remove the excess tube bits off the outside of the frame. At this point, I sharpened the tube and then applied the Xero Porcelain filter. This just gives the filter a pretty glow. Give a slight drop shadow to the tube. 8. Now add and place any of the scrap bits around the tag, I leave that up to you however you wish. Give a drop shadow to whatever bits you feel apropriate. 9. Re-size your tag to the size that you prefer most if you started with a bigger canvas. At this point, I'd also sharpen each layer. That just keeps things clear so colors don't bleed so much. 10. Add your copyright and watermark, making sure that the copyright information is clearly visible at first glance. 11. Now it's time to add your text, I chose to use Saginaw Bold on this one. I chose a color from the paper underneath the frame, #4dcfd5. Then I applied Super Blade Pro Glass (coconut ice) setting, followed by Eye Candy 4000 Gradient Glow setting. My setting I used as just the 'Fat" setting. On the first panel, it's 3, 0, 100 and on the second panel, just choose your color, and for this tag, I chose Black. Apply a drop shadow of your choice. I like mine to be subtle, so I used 0, 0, 75, 5 and #1e6f70. 12. Save as a png file and that's it voila! I hope you found this very easy to do and I didn't confuse you too much along the way. 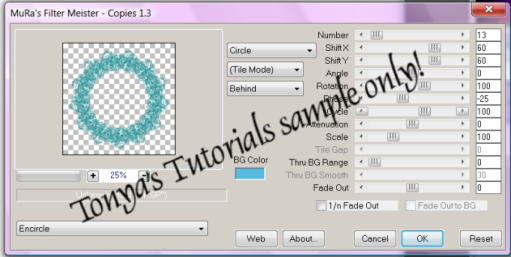 This tutorial was written by Tonya on August 31, 2008 and absolutely no part of this tutorial may be taken or used without my expression permission.